Gwydyr and Clocaenog represent contrasting forest types in north Wales, UK. Gwydyr is a relatively low lying and sheltered forest while Clocaenog is more typical of an exposed upland site. 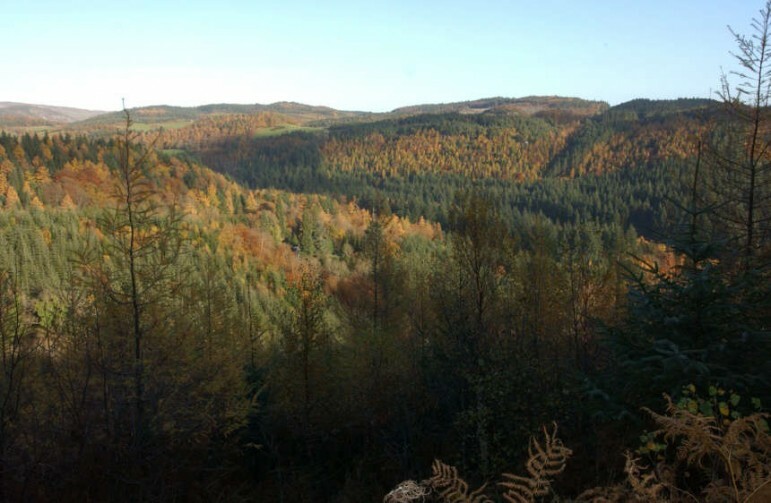 The Case study forest areas are: Gwydyr 5839 ha, Clocaenog 5662 ha. Both forests were largely created in their current form, through planting over a relatively short period of time. Figure 1. Gwydyr forest, North Wales. Figure 2. Clocaenog forest, North Wales. The climate change context is a likelihood of warmer conditions by 2080. In some variants of the A1B scenario there will also be a potentially drier summer climate throughout Wales due to decreased summer precipitation. Rainfall is expected to increase in winter, with the potential to increase windthrow hazard through a reduced cohesion of wetter soils and shallower water-tables. The region has a mixture of soil types ranging from deep peats to fertile brown earths. Freely draining mineral soils may lack water holding capacity to buffer the effects of summer droughts in the future. 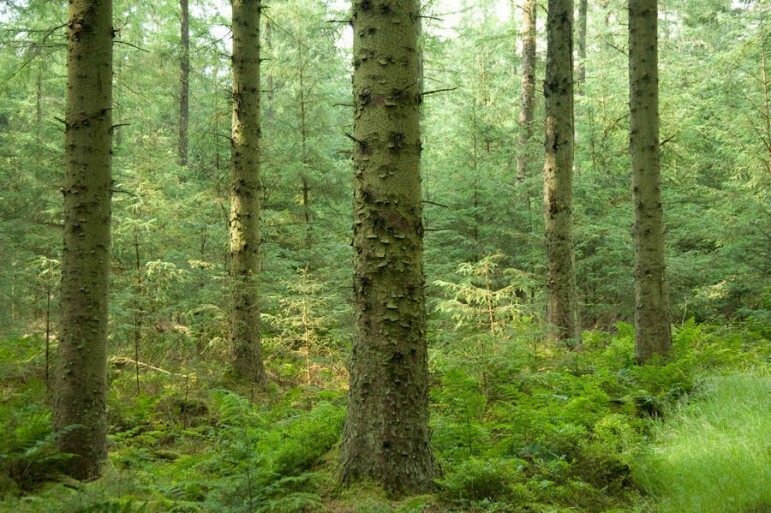 Clocaenog forest was established at a relatively high elevation and is dominated by Sitka spruce plantations. These are mostly managed as clearfell – replant stands, but where possible they are being converted to continuous cover management regimes to provide some structural diversity. Gwydyr is largely more sheltered and lower lying, and has a much greater diversity of tree species and a much greater potential for continuous cover forestry. The requirements for forest ecosystem services are: Sustainable production of timber, paper pulp, biomass for energy; Recreation; Habitat protection and connectivity; and Water. Climate change is expected to affect the growth and survival of forest trees through increased mean annual temperature and rainfall, while increasing the risks from storms, summer drought, pests and diseases. Towards the end of the century some variants of the A1B scenario indicate much drier conditions in the region. This would be expected to cause previously high yielding sites to be constrained by drought, so yield would drop. Tree species in these forests have different sensitivities to climate change with some expected to become more suitable and others expected to become less suitable (see species maps below). Pines and broadleaves can sustain their current output levels in the context of the drier A1B variants studied, while Spruce is only expected to do so where the climate projections suggest little or no decline in summer precipitation. Fig. EN-1. Clocaenog species composition change by 2080 with Species Diversity storyline. Comparison of species composition between the baseline and five contrasting variants of the HadRM3 A1B 11 member ensemble. The maps on the left are for baseline and for variants with a warmer climate and reduced summer rainfall, and maps on the right show outcome for variants with warmer climate and little or no change to rainfall. Overall, forest growth models run with the climate projections indicate that the dominant species in these forests, Sitka spruce, is at risk of declining in productivity after 2050 if conditions become drier, while other main species should maintain their productivity. In the event of moisture deficits only changing slightly, Sitka spruce yields might increase substantially where temperature has hitherto been a limiting factor. However in Clocaenog, increased growth rates will also expose trees to higher risk of storm damage earlier than might have been otherwise expected. Business as usual provides opportunities to achieve current goals under some future climate scenarios. 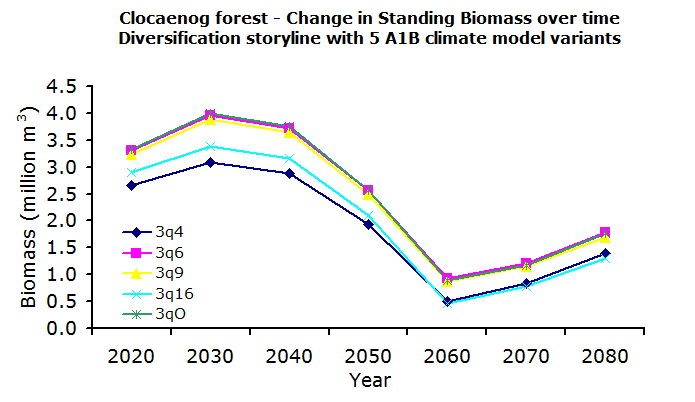 However, Diversification as an adaptation strategy is expected to lead to less uncertainty, with projected standing biomass for all variants being between the highest and lowest projections for Business as Usual. Therefore although BAU has a possibility of higher returns, it also has a possibility of much lower returns than Diversification. Studies of Business as Usual management assuming no climate change suggest that the current species choice is appropriate for conditions based on the period 1960-1990. A suite of decision support tools and models were used to examine case study outcomes to 2080 based on differing management strategies: Business as Usual, Species Diversification, Short-rotation forestry and Low-impact silvicultural systems (LISS) that is essentially conversion to continuous cover. Business as usual (BAU). 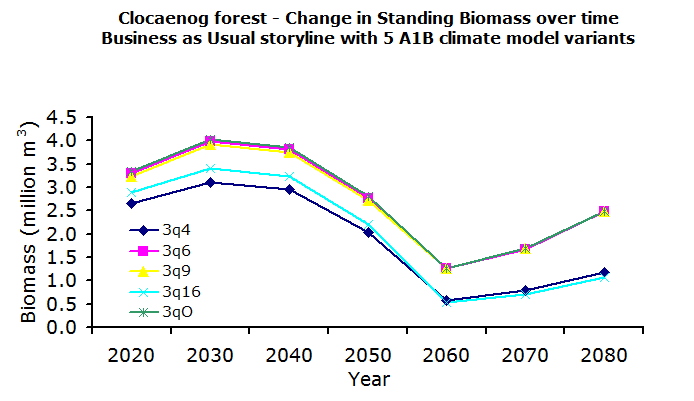 This was the ‘Conservative’ trajectory (see D4.4), replacing forest stands ‘like for like’ with the same species and maintaining forest management alternatives as they are over the simulation period. Species Diversification (DIVERSE). This followed a ‘Progressive’ trajectory for species mix. Species suitability was modelled at each 10-year period and species were changed at scheduled interventions (usually clearfell, replant) to maximize species diversification whilst also maximizing production. Other species diversification rules from the Welsh policy guidance document “Species Diversification” were used to accelerate diversification where possible, but these also restricted diversification in places due to the need to maintain populations of some species such as Scots pine and Norway spruce for other objectives. When a stand is restocked, ESC selects a replacement species based on highest yielding suitable species. Transformation to a Low Impact Silvicultural System (LISS). This followed a ‘Progressive’ trajectory aspiration for FMA change. It applied continuous cover forestry (CCF) as widely as possible, constrained by wind exposure to lower elevation sites. In practice this would be further constrained by operational considerations. Conversion to short rotation forestry for biomass production (SRF). Stands reaching the end of their FMA4 management were subsequently replanted with the same species on a 25 year rotation. Norway Spruce and Scots Pine in those areas would be retained on 100 year rotations to support habitats for rare species (e.g. red squirrels). Assess which stands to fell based on whether they have reached their rotation length for given management regime. Update database with changes and repeat process. Models provided outputs as a range of ecosystem service indicators, including: Timber outturn volume; Standing Carbon; Recreation index; Biodiversity index and Wind damage risk status. The ESC suitability score gave a measure of the suitability of the species for a given site under prevailing climatic/soil conditions at a particular time. Our previously limited experience of some of the species that appear useful for climate change adaptation is being improved with new species trials that are now underway. However, where site quality is poor (due to exposure and/or soil nutrient status), the range of species available for planting will remain limited. Conversion to continuous cover forestry (CCF) is constrained by wind exposure to lower elevation sites, and implementation rates of all adaptation options are constrained by operational restrictions, i.e. less than 1% of the forest can be converted each year.